M@ How Deep Does London Go? The tube network is just one of many subterranean spaces in London. With sewers, water pipes, bunkers, basements, and assorted other tunnels, it's a maze down there. We've attempted to summarise some of these systems in one diagram, including the yet-to-be-built Thames Tideway sewer tunnel. The graphic shows typical depths below surface level (or high-tide level for the Thames foot tunnels). Where depth is variable, we've shown the average as a horizontal stretch of tunnel, plunging down to the deepest point. For example, the tube varies greatly in depth, but is typically 24m. The deepest point is below Hampstead Heath at Bull and Bush (where a station was part-built, but never completed), which reaches 67m. The deepest space in London is the recently completed Lee Tunnel, a relief sewer that slopes down to 80m beneath Beckton. 5-6m cut-and-cover underground: watch our Secrets of the Circle Line, District Line, Hammersmith & City Line and Metropolitan Line. 6m Whitehall tunnels: read about our visit to the tunnels beneath the Churchill War Rooms. 15m Greenwich foot tunnel: Wikipedia entry. 19.5m Woolwich foot tunnel: Wikipedia entry. 21m Mail Rail tunnels: watch our video of a ride through the tunnels. 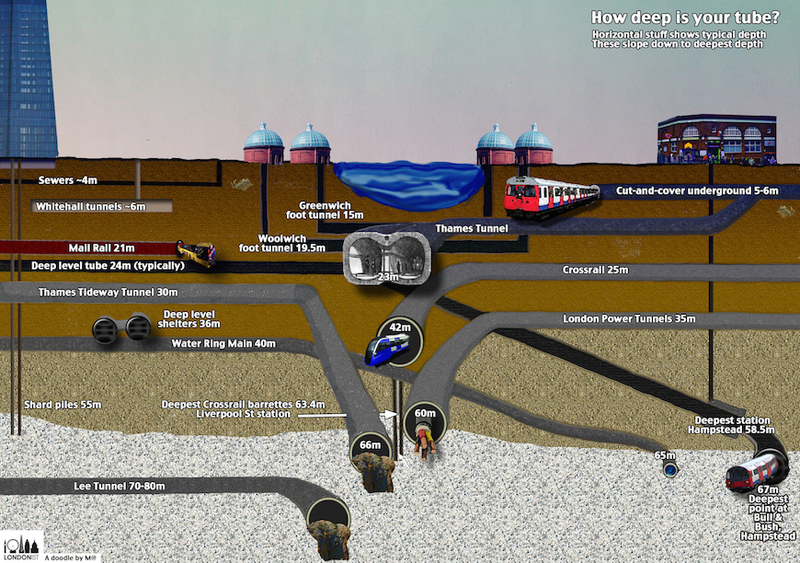 24m (down to 67m) Tube (deep level): see our Secrets of the Underground DVD. 25m (down to 42m) Crossrail: see our video inside Farringdon Crossrail. We also took one of the first rides through a Crossrail tunnel. 30m (down to 66m) Thames Tideway Tunnel: London's yet-to-be-built super sewer. Official page. 35m (down to 60m) London Power Tunnels: newly dug tunnels for London's power supply. Official page. 36m deep level shelters: Built during the Second World War. See our recent visit to Clapham Common shelter, which houses a subterranean farm. 40m (down to 65m) water ring main: supplying fresh water to Londoners. Wikipedia page. 55m Shard piles: designer's website. 70m (down to 80m) Lee Tunnel: see our video inside London's deepest tunnel. Naturally, our graphic is only scratching the surface, so to speak. We've left off several road tunnels, tram tunnels, service tunnels and plenty of bunkers, for the sake of clarity. With thanks to the Crossrail press team and engineers for a few hard-to-find details.